The fight to free the WikiLeaks whistleblower continues in the courts of law and public opinion - but justice is expensive. Chelsea Manning was an all-American patriot when she joined the U.S. military in 2007 at the height of the surge in Iraq. But when she saw what her country was actually doing abroad — handing over thousands of Iraqi Sunnis to be tortured by state-sponsored Shiite death squads, for instance — she decided she couldn’t be a part of it. Nor could she just do nothing as injustices were committed in her and every American’s name. So, using the access available to her as an Army intelligence analyst, she downloaded gigabytes of classified evidence that war crimes were being committed onto CDs “labeled with something like ‘Lady Gaga,’” as she told a federal informant. In 2013, a military court sentenced Manning to 35 years behind bars for leaking that evidence, including thousands upon thousands of diplomatic cables, to the whistle-blowing website WikiLeaks. The guilty verdict came after Manning was subjected to 11 months of what the UN special rapporteur on torture called “cruel and inhuman” solitary confinement. If she serves her full sentence, Manning, now 27, will be 60 years old when released, though she will reportedly become eligible for parole in 2020. But supporters want her out now — and believe that the way she was treated before she went to trial could be the key. “We have to appeal this on Chelsea’s behalf,” said criminal defense attorney Nancy Hollander, one of a team of lawyers looking to do just that. Hollander was speaking as part of a recent panel discussion on the Obama administration’s war on leaks. This war, like others declared on nouns, has tended to hurt the least deserving: in this case, conscience-driven whistleblowers like Manning, but not any of those chatty “senior administration officials” who casually leak inside information to the press. Such is the difference between releasing classified information that informs the public but bothers the national security state, as Manning did, and leaking what often proves to be disinformation that flatters those in power, as their lackeys do. Let’s remember what landed Manning in prison: releasing a video of an incident in which U.S. soldiers killed more than a dozen unarmed civilians in Iraq, including two journalists working for Reuters. At the time of the incident, a military spokesman said that the soldiers, who fired at a dad driving a minivan with his kids inside, “were clearly engaged in combat operations against a hostile force.” Manning proved otherwise. Manning also revealed that Yemen’s former dictator, Ali Abdullah Saleh, was colluding with the Obama administration to cover up an undeclared U.S. war against al-Qaeda in the Arabian Peninsula (of which any “military-age male” killed in a drone strike is considered to have been a member). That war has killed hundreds of civilians — with one U.S. air strike alone wiping out 41 innocent Yemenis, including 21 children, according to Amnesty International. But justice is expensive. 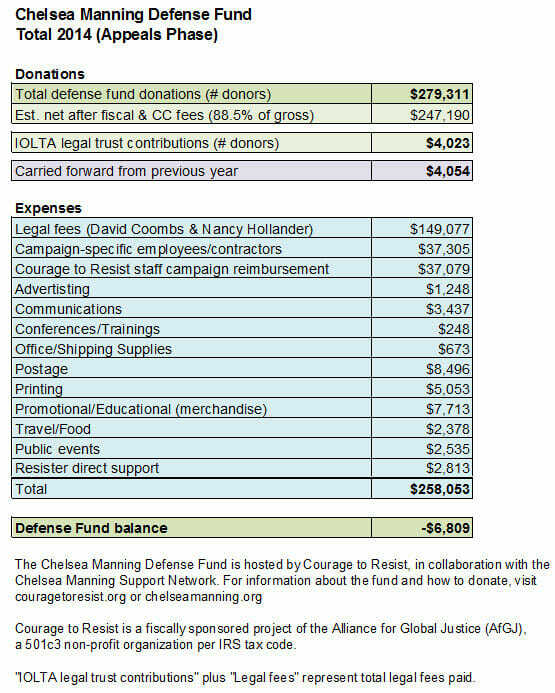 In 2014 alone, the Chelsea Manning Defense Fund spent $149,000 out of a total of $247,000 in donations on Manning’s legal team. As of March 31, 2015, that team was owed close to $100,000. Melissa Keith works for the Chelsea Manning Support Network, a project of Courage to Resist, a group that supports conscientious objectors. She told me that the $100,000 not spent on legal fees in 2014 went toward defending Manning in public. Another $74,000 went to the salaries of staff who worked on “public education and awareness,” said Keith, which involved placing ads and Manning’s own writing in newspapers, as well as organizing and promoting events to draw attention to her case. The network also says that the fund helps pay the travel costs of those visiting Manning, “especially her mother and relatives living in Wales,” and for her college education. Though owed tens of thousands of dollars, Manning’s lawyers have not stopped working (the fund paid $10,000 toward its bill in March after receiving $10,636 in donations, or $9,412 after bank fees). The shortfall has led Manning herself to appeal for funds on her new Twitter account. Her posts are currently dictated over the phone from military prison at Fort Leavenworth, Kansas to an employee of the public relations firm Fitzgibbon Media, according to a handwritten letter from Manning. That firm has been paid by the Chelsea Manning Support Network to promote Manning’s cause. “Since Chelsea’s initial tweets, we’ve raised about $40,000,” said Keith, who estimates that about $8,000 came as a direct result of those posts on the 140-character social network. That still leaves the fund’s debt to the legal team at more than $50,000 — and with Hollander charging $400 an hour (not unusual for a top-tier defense attorney, according to lawyers I asked to review the invoice), the legal debt grows by about $10,000 a month. Where does that process end, though? Manning’s lawyers expect to have a hearing before the U.S. Army Criminal Court of Appeals sometime this year. If that appeal goes nowhere, though, the case could go to the civilian system — and from there to the Supreme Court. Davis is a writer and producer based in Los Angeles. His work has been published by outlets such as Al Jazeera, The New Republic, and Salon. this article originally published by Foreign Policy in Focus is licensed under a Creative Commons Attribution Licence. Read more articles tagged with: Chelsea Manning. You can find this page online at http://sacsis.org.za/site/article/2391. It would be really helpful if someone could explain how Obama, who looked at first as though he was against the sickness which is destroying American society, came to become part of it.